Hey Butterflies! So I've personally never been to a Studio Movie Grill, but with it being basically summer already there are a lot of new movies that are hitting the big screen (like Spiderman and soon the new X-Men) and with that being said; lately I'm hearing a lot of talk about how great Studio Movie Grill is and now I really want to experience SMG. 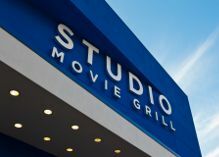 For you guys who've never heard of Studio Movie Grill; SMG combines the latest Hollywood releases, featuring 100% digital projection, with restaurant quality food and beverage from an American Grill menu and full-service bar. Want to experience SMG too? For movie listings, showtimes, and directions to a SMG theater, please visit StudioMovieGrill.com and if you use promo code SMGFamily you can get a $5 movie ticket to any movie of your choice! Sweet right? Also, there's a new bar and lounge area at SMG Copperfield location for all of my Houston area readers so be sure to check it out and let me know what you think!